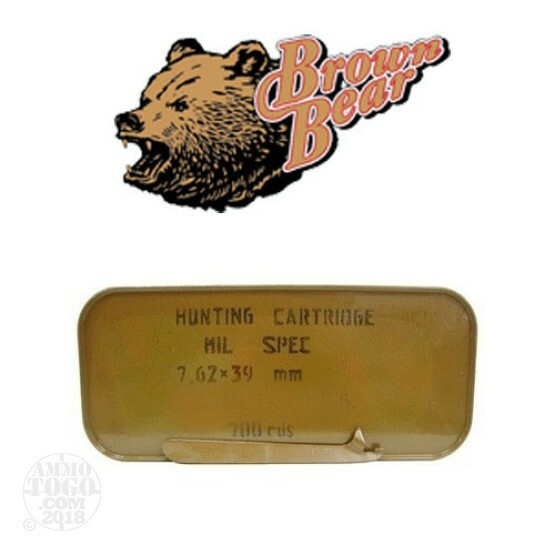 This is 7.62x39 Brown Bear Mil-Spec 123gr. Full Metal Jacket Ammo in a Sealed Spam Can. This ammo is manufactured by JSC Barnaul Machine-Tool Plant in Russia. The Barnaul plant is considered the premier ammunition plant in Russia, and they supply the majority of the ammo to the Russian military. This ammo is 100% non-corrosive, steel cased, and new factory ammo. This ammo is packed in 20rd. boxes, 700rds. per sealed spam can. The most accurate FMJ 7.62x39 ammo on the market. Groups better and shoots cleaner than Wolf. Nobody makes it better than Barnaul. The most accurate FMJ 7.62x39 ammo on the market. Groups better and shoots cleaner than Wolf. Nobody makes it better than Barnaul. I agree. Never had a misfire with it and very accurate. Also, after I clean the gun, 200 rounds, residue is not bad at all, mostly the carrier has some black crud that comes right off.